Pattern: The Elizabeth Tunic (Ravelry link). This is a very well-written pattern with many great details, such as short rows to raise the back of the tunic, and a tab for the buttonholes. Also, there are increases incorporated in the garter stitch yoke, which makes it lay nice and flat on the shoulders. I really liked all the finished versions on Ravelry, especially ones where the yoke is a solid color, and the body of the tunic is handspun or variegated. I want to try that if I knit this pattern again, which is very likely. I knit the 3 months size (second smallest) without too many modifications. The biggest change was the addition of little sleeves. In retrospect, I probably should have left out the sleeves: something about the proportion of the little sleeves to the full skirt doesn’t quite jive. Or maybe I should have knit a more modest skirt to go with the little sleeves. Oh well, next time ;). Oh, and I added little pockets. Yarn: Ripe Persimmon hand dyed, handspun, superwash merino/cashmere/nylon (80/10/10) yarn that I purchased from Pigeonroof Studios. I used about 200 yards/130 grams of yarn for this tunic. The yarn was an absolute delight! The contrast yarn is sportweight Louet Gems merino in the cream (#30) colorway. Needles: US 4 (3.5 mm) circs for most of the knitting, with US 2 (2.75 mm) for some of the garter stitch portions. My gauge using the larger needles was about 5.25 stitches and 8 rounds per inch, after blocking. Finished measurements: because my gauge was a little tighter than the pattern specified, the tunic has a 15″ chest circumference, and is 11″ from top of shoulder to hemline. This is closer in size to “newborn” according to the pattern, which is fine, because the recipient is still in utero ;). 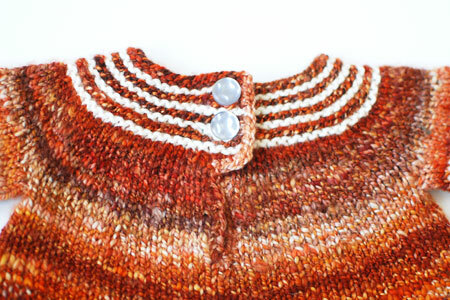 Notions: 2 pearly shank buttons from Windsor Button. 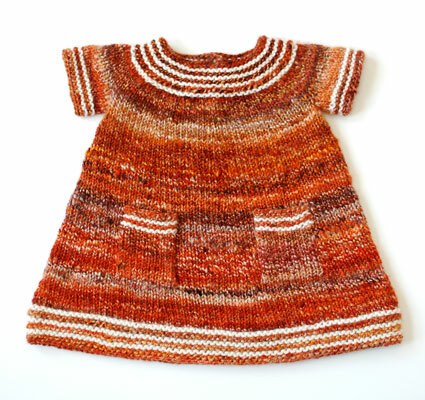 Another delightful combination of handspun yarn and handknit pattern for baby! I will never, ever tire of using the two together :). That is best example of that pattern that I have seen. And I think the sleeves are perfect. They make it more than a tunic – a sweet little dress. Adorable! I’ve been trying to figure out what to make for my friend’s little newborn. I think I found it! Big love!!! The colors are awesome!! Congratulation! I think it’s gorgeous, and I’m sure it’ll look great on the actual baby. I always think the sleeves look funny when I knit a baby garment, but they work out ok. gorgeous!! i love it! the colors really pop and I especially love the collar!! I love the pockets. Wouldn’t want little one to not have a place to stash her (giant, plastic) house keys. I am in love with this! I want to become a baby again so I can wear it!! That is SO CUTE! Cutesy baby fo I’ve seen in a long time. Congrats! I like your version (with sleeves) better. The top seems more balanced. Love the sleeves…totally looks balanced. Will you share how you knit the sleeves in? So adorable! May have to make one as a standby present to the next friend to have a baby girl. Thanks for sharing. That is a super cute top. Is this one for your baby or someone elses? You’ve been making so many baby things that sometimes it feels like you are going to single handedly cover all of the world’s babies in beautiful hand knits! The yarn/pattern combo are perfect!! So beautiful. Actually, I think the sleeves look fine. I love this combination of yarn and pattern. 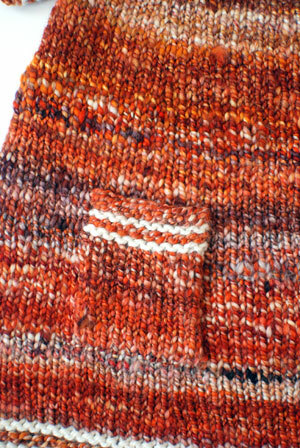 And the little details you added accent the handspun. Lovely! Lucky recipient! OK I can’t say anything that hasn’t been said… it’s a super cute pattern and the coloring of the yarn is wonderful! Congratulations on another beautiful finished object! Ooohh, what a beautiful baby tunic. Love the color! Oh man I wish I had a little girl I could knit that for. Ack! Love it! Very cute! Little girls clothes are so much more fun than little boys ‘sigh’. I love this piece! Nice colors. Makes me wish i had a little girl to make one for. The pockets are especially adorable!